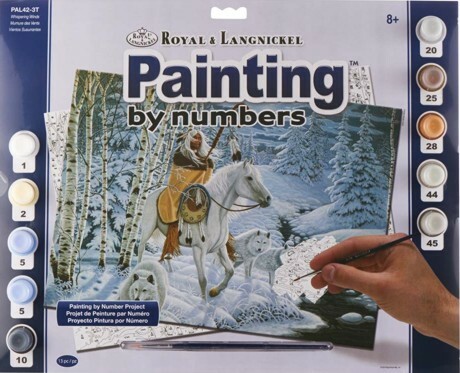 The Whispering Winds Wolf Paint by Number Kit features the most gorgeous Wolf picture of a Native american riding a white horse. He is traveling with 3 beautiful White wolves in a snow covered setting. This kit has everything you need to paint this picture, 10 Paint pods, 1 Preprinted board, 1 Preprinted Practice Sheet and 1 Paint Brush. Recommended for ages 8 and up. Makes a wonderful Wolf gift.